US president Donald Trump has sacked Rex Tillerson as his secretary of state and will replace him with CIA director Mike Pompeo. 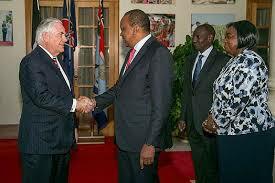 The US president asked Mr Tillerson to step aside after months of speculation that the pair had fallen out. 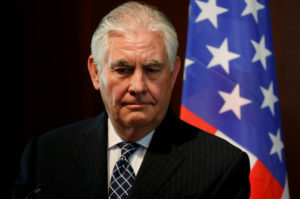 It triggered a war of words within the US government as the State Department accused the president of not talking to Mr Tillerson before the sacking. Mr Trump cited the pair’s differences on the Iran nuclear deal, which the president wants to scrap, when asked about the reason for the change. CNN reported that Mr Tillerson first found out about the sacking from Mr Trump’s tweet. He had just returned from diplomatic trip to Africa. Mr Tillerson, a former oil executive, will be replaced by Mr Pompeo, who as the head of the CIA is involved in the president’s daily intelligence briefinf – providing his appointment is confirmed by Congress. There were US media reports that Mr Trump asked Mr Pompeo for advice about topics beyond intelligence before Christmas, when it was said the president was considering making the switch. “Mike graduated first in his class at West Point, served with distinction in the U.S. Army, and graduated with Honors from Harvard Law School. Mr Trump later said on Tuesday that the pair “were not really thinking the same” on the Iran nuclear deal, which the president called “terrible”. He said he got on with Mr Tillerson but added that they did not have “chemistry”. Mr Trump also praised the strength of his relationship with Mr Pompeo. Mr Tillerson joined Exxon Company, USA, in 1975 as a production engineer and worked his way up the ranks to become Chairman and CEO in 2006. In 2017 he severed all ties with ExxonMobil, in compliance with conflict-of-interest rules as Secretary of State. President-elect Donald Trump announced Tillerson as his choice for secretary of state in December 2016, saying he would be “a forceful and clear-eyed advocate for America’s vital national interests”. Tillerson’s experience in diplomacy stems from making deals with foreign countries, but questions were immediately raised about the oil executive’s relations with Russia. In 2018, US President Trump replaced Tillerson as Secretary of State. In March 2018, President Trump ousted Tillerson from the White House, replacing him with CIA director Mike Pompeo.